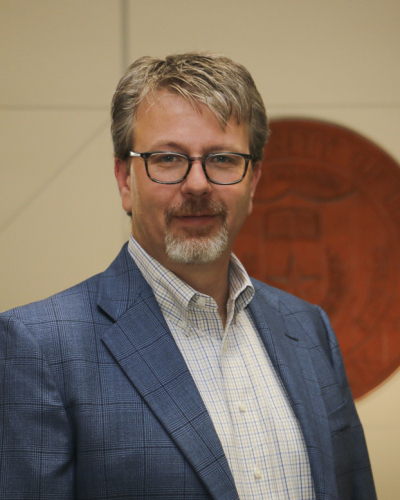 Chris Brownson is an Associate Vice President for Student Affairs and Director of the Counseling and Mental Health Center at the University of Texas at Austin. His portfolio also includes University Health Services and the Center for Students in Recovery. Brownson was appointed as a Chancellor's Health Fellow at the University of Texas System in 2014, and he currently leads a $5 million project implementing after hours crisis counseling in all 14 academic and health institutions in the UT System as well as bystander intervention, alcohol prevention and early intervention, and collegiate recovery centers at the 8 academic institutions in the UT System. Brownson is the president-elect of the Texas University and College Counseling Center Director's Association. He is a past chair of the Higher Education Mental Health Alliance, the Section on College and University Counseling Centers of APA's Division of Counseling Psychology, and the Mental Health Section of the American College Health Association (ACHA). He is a past member of the Board of Directors of ACHA. He co-developed the Integrated Health Program at UT, which provides mental health services in the university's primary care clinic. He has been a program evaluator for several SAMHSA/GLS suicide prevention grants, consults with colleges and universities on their counseling and health services, and was the National Mental Health Consultant to Teach For America from 2006-2016. Brownson has been the director of the National Research Consortium of Counseling Centers in Higher Education since 2004. The research team that guides Research Consortium projects is comprised of graduate students from UT, and together have conducted two large national studies on college student suicide, each involving 70 other institutions of higher education across the nation with over 26,000 research participants. Currently, Brownson and the Research Consortium team is leading a longitudinal study with 18 other institutions of higher education looking at the intersection of psychological factors and academic success. DeLuca, S., Franklin, C., Yueqi, Y., Johnson, S. & Brownson, C. (2016). The relationship between suicide ideation, behavioral health, and college academic performance. Community Mental Health Journal, 52(5), 534–540. Brownson, C., Drum, D., Becker, M., Saathoff, A. & Hentschel, E. (2016). Distress and Suicidality in Higher Education: Implications for Population-Oriented Prevention Paradigms. Journal of College Student Psychotherapy, 30, 98–113. Drum, D., Brownson, C., Hess, E., Burton Denmark, A. & Talley, A. (2016). College Students' Sense of Coherence and Connectedness as Predictors of Suicidal Thoughts and Behaviors. Archives of Suicide Research. doi:10.1080/13811118.2016.1166088. Tran, K., Wong, J., Cokley, K., Brownson, C., Drum, D., Awad, G. & Wang, M. (2015). In their own words: A qualitative study of suicidal Asian American college students' perceptions of protective factors. Death Studies, 39, 500–507. Lytle, M., DeLuca, S., Blosnich, J. & Brownson, C. (2015). Associations of religious and racial/ethnic identities with suicidal ideations of gay, lesbian, bisexual, and questioning individuals. Journal of Affective Disorders, 178, 39–45. DeLuca, S., Yueqi, Y., Lytle, M. & Brownson, C. (2014). The associations of race/ethnicity and suicidal ideation among college students: A latent class analysis examining precipitating events and disclosure patterns. Suicide and Life Threatening Behaviors, 44, 444–456. Wong, Y., Brownson, C., Rutkowski, L., Nguyen, C. & Becker, M. (2014). A mediation model of professional psychological help seeking for suicide ideation among Asian American and White American college students. Archives of Suicide Research, 18, 259–273. Brownson, C., Becker, M., Shaddick, R., Jaggars, S. & Nitkin-Kaner, Y. (2014). Suicidal behavior and help seeking among diverse college students. Journal of College Counseling, 17, 116–30. Brownson, C. (2012). Lessons from Campus: College Students and Mental Health. Psychiatry Weekly, 7(17). Wong, J., Brownson, C. & Schwing, A. (2011). Risk and protective factors associated with Asian American students' suicidal ideation: A multi-campus, national studdy. Journal of College Student Development, 52, 396–408. Brownson, C., Drum, D., Smith, S. & Denmark, A. (2011). Differences in suicidal experiences of male and female undergraduate and graduate students. Journal of College Student, 25, 277–294. Brownson, C. (2010). Conducting research in college and university counseling centers. Mental Health Care in the College Community. England: John Wiley and Sons. doi:978-0470746189. Tucker, C., Sloan, S., Vance, M. & Brownson, C. (2008). Integrated care in college health: A case study. Journal of College Counseling, 11, 173–183. Westheimer, J., Steinley-Bumgarner, M. & Brownson, C. (2008). Primary care providers' perceptions and experiences with an integrated healthcare model. Journal of American College Health, 57, 101–108. Brownson, C. & Gilbert, L. (2002). The development of the Discourses About Fathers Inventory: Measuring fathers' perceptions of their exposure to discourses. Psychology of Men and Masculinity, 3, 85–96. Hartzler, B. & Brownson, C. (2001). The utility of change models in the design and delivery of thematic group interventions: Applications to a self-defeating behaviors group. Group Dynamics: Theory, Research, and Practice, 5, 191–199. Gilbert, L. & Brownson, C. (1998). Current perspectives on women's multiple roles. Journal of Career Assessment, 6, 433–448. Oversee $2,398,800 allocation to lead implementation of on-line alcohol prevention, early intervention for high risk drinking, and centers for students in recovery at all eight UT System academic institutions. Oversee $2,552,268 allocation to lead implementation of after-hours crisis lines and bystander intervention initiatives for all fourteen academic and health institutions in the UT System. Co-PI for $398,000 30year grant called Well-being in Learning Environments, a program designed to develop and study how to increase well-being in the college classroom in collaboration with faculty at UT. Co-PI on $100,243 grant from the University of Texas at Austin Information Technology Services to develop an iPhone app to enhance wellness in UT students, called Thrive@UT from 2014-15.